Varenie is our favorite way of preserving summer fruit. It is a kind of jam, where you have whole pieces of fruit in lots of transparent colorful and aromatic syrup. 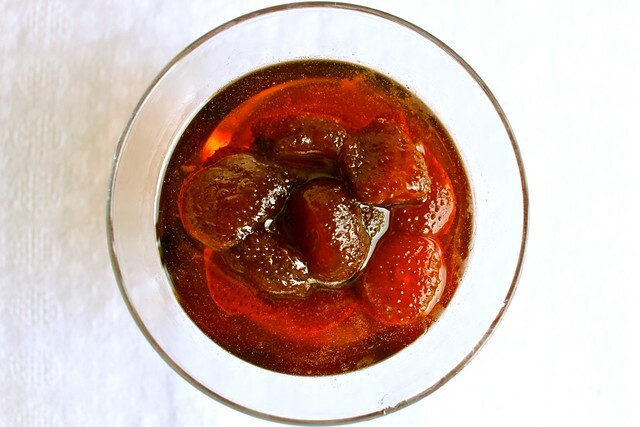 If it is well done, the fruits also get almost translucent and spread evenly throughout the jar (do not fall to the bottom or float on the surface). In closed pasteurized jars it stores almost forever at room temperature. After the apricots (for which I guess I'll have to wait for at least a month more) strawberries are my favorite fruit for varenie. Leaving aside the result I really love the process of making it. It is one of those great things to do on the weekend around your family or on your own. What you are going to see, smell and taste throughout it is incredibly beautiful. The technology is the same for many different fruits, so you can safely try in on your favorites. I mostly make apricots, strawberries, cherries, quince and raspberries. Strawberry varenie in particular works really well in kovrizhka and for cheese cookies. From start to the end it takes around 1.5 days, but most of this time is of course inactive. You get seriously involved at the beginning to prepare the fruits and make the syrup. Then you cook the varenie for 5 minutes, let it rest for 5 hours, cook it for another 5 minutes and let it rest again. This normally repeats for 4-5 times before you get the ready varenie. It is nothing complicated, but as it takes a while it makes sense to work with at least 2.5 kg of fruit at once. The recipe is for one kilo, so you can use the multiple you need. 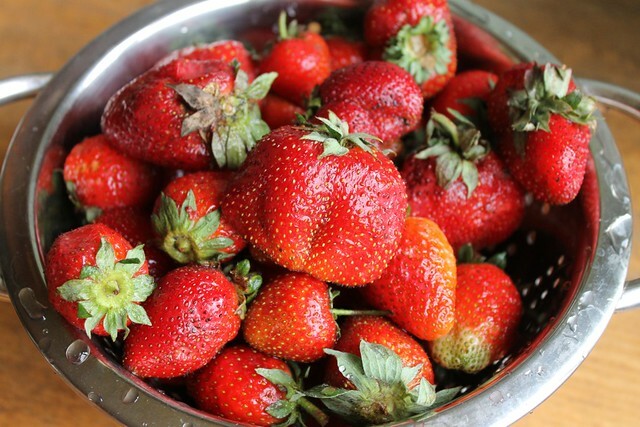 Soak the whole strawberries in cold water for 5 minutes, then wash and drain well. Remove the stalks (it is important to do it after washing, otherwise the strawberries soak up lots of water). Leave small and medium berries whole and cut the big berries in half. Pour the ready hot syrup into the pan with prepared fruit. Let it stand uncovered for 5 hours. Then start cooking. Do everything without lid. Bring the jam to boil and cook for 5 minutes on low heat. It is better not to stir it if you would like to keep the strawberries whole. Skim off scum if any. Turn off the heat and let it stand for another 5 hours, then repeat. To get it done you will need around 4 - 5 iterations. You can check whether the jam is ready when it is at room temperature. Lose a drop of the syrup onto your thumb nail (traditionally you'd use cold plate but I do it the family way). The drop should hold. Bring the jam to boil and take off the heat. Ladle the hot ready jam into jars, filling them almost to the top (leave around 1 cm empty). Close the jars tightly (while the jam is still hot) and let cool. While they cool down the lids should sag in a little. Closed jars can be stored for months at room temperature. Once open the jar also normally stores at room temperature for some time, but to prevent any risk, store them in the fridge.